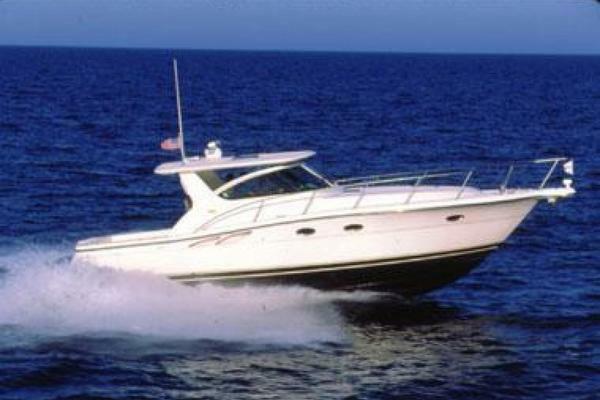 1991 Ocean Yachts 42 S/S, boat has a newer style interior with Corian and new appliances. Rich teak wood interior gives the feeling of a traditional classic yacht. Great layout with large master forward with private head and guest stateroom with a head. Large galley up with dinette and large salon. Come see this boat and bring an offer! Twin 485 HP Johnson & Tower 6-71 Detroit Diesels and an 8KW Onan Generator! The 42 Ocean was one of the new generation sport fish's introduced in the early 1990's. They had a more streamlined appearance than previous models including a revised hull with additional transom deadrise and a shallower, slightly longer keel. These changes made for improved handling and a better rough water ride. With the optional 485 HP Detroits the boat will cruise at 26 knots and top out at 30 knots. The teak interior is arranged with a walk around double berth in the forward master stateroom and a double (plus a slide-out single) berth in the guest stateroom. The galley is forward in the salon, opposite the L-shaped dinette, and a icemaker aft, adjacent to the sliding salon door. The cockpit is loaded with a full array of fishing amenities including cockpit controls, bait freezer, transom door, tackle locker, large fish box, and a in-floor livewell. 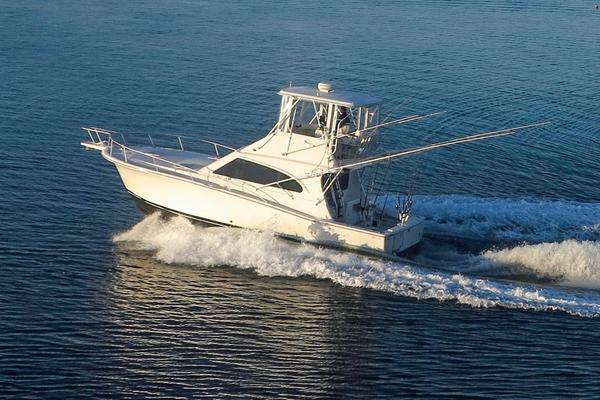 Additional features include a hardtop, bow pulpit, stainless steel bow rail, stainless steel cleats, 3-large deck hatches, fresh & saltwater washdown, electric windless anchor, remote operated spotlight, and 50 amp shore power service. . This boat was completely painted in Alexseal from the rubrail up. Interior carpet has just been replaced and Corian countertops have been installed in the galley and above the aft salon icemaker. In the galley you will also find a stainless steel Kitchen Aid dishwasher, stainless steel Summit fridge/freezer, Summit glass cooktop, stainless steel sink, and a Sharp convection microwave. On the starboard side aft of the galley there is also a ultra leather convertible couch. Electronics include a Northstar 958 gps/plotter, Furuno FCV-1100L sounder, Simrad AP 16 autopilot, Raytheon Ray 210 marine VHG, Danforth compass, and a Clarion XMD3 marine radio with marine MTX speakers.